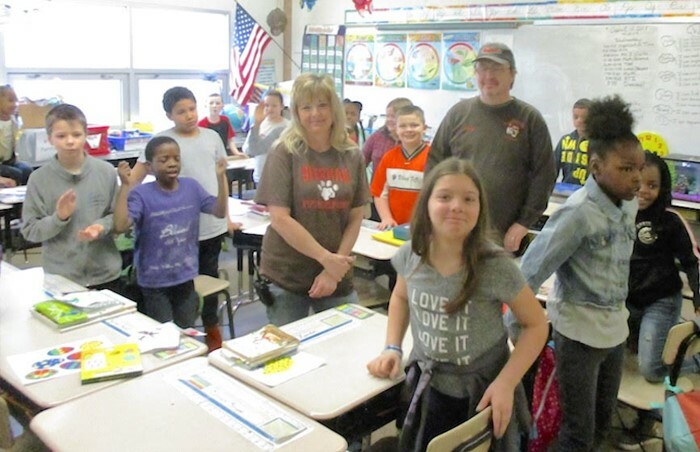 Sherman Elementary School custodians Lisa Maynard and Bruce Brewer stand amid third-graders who did the best job of keeping their room clean over a period of several weeks. The story began several weeks ago when Maynard and Brewer were working overtime – 12 ½ hour shifts – because for a while there was no overnight help in the wing that houses the five third-grade classrooms. In March Maynard went into the third-grade classrooms to explain to students that each week she and Brewer would award a “hand” to the room that did the best job of picking up paper and turning their chairs upside-down on their desks to make the custodians’ more thorough after-school cleaning easier and faster. “To motivate them, we promised that the room that received the most hands would get pizza,” Maynard said. Last Friday she delivered pizzas to Kevin Stone’s room. Jordan Monica’s third-graders finished second and got cookies. Brewer said the weeks-long challenge was a success. “It made a major difference. Less time was needed to clean the rooms. The kids loved it and they did a great job,” he said. "They were motivated and they responded." Stone said he believes his class will be more aware of keeping the room neater after winning the cleaning competiton. "All were involved. Some worked harder than others. A few were sweeping, trying to do it all," he said, laughing. Maynard has worked in Mansfield City Schools for 22 years, the last four at Sherman. Brewer is in his 29th year in the district, the last five at Sherman. “As a district, we are committed to positive reinforcement of good behavior and rewarding students who display good behavior,” Brennan said. Maynard and Brewer are familiar to the 438 children in kindergarten through third grade at Sherman. They greet, motivate and encourage kids every day in the cafeteria and hallways. Second-grade teacher Bernie Redman, who happened to be in the office when the result of the cleaning contest was mentioned, offered unsolicited praise of Maynard and Brewer. “They are two of the best, the very best,” she said.